United States president Donald Trump has accused the NFL of "total disrespect" after it decided it will not punish players for not standing during the national anthem. 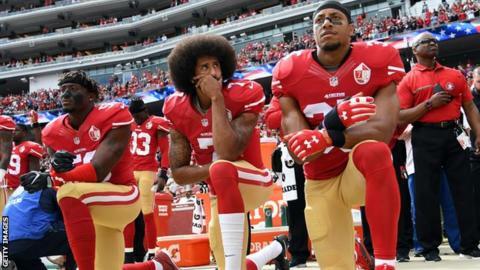 Players this season have followed the practice started by quarterback Colin Kaepernick of kneeling in protest against racial injustice. Trump tweeted: "The NFL has decided it will not force players to stand. "Total disrespect for our great country." Kaepernick was not invited to Tuesday's NFL talks about the protests despite other players indicating they wanted him there, his lawyers said. The governing body met team owners and player representatives in New York and described the talks as "productive", although no concrete steps to address the issue were announced. Quarterback Kaepernick first sat down during the US national anthem in August 2016, before opting to kneel instead, in protest against racial injustice. Other players followed suit, and the movement spread after criticism from Trump last month. Kaepernick, 29, has been without a team since he opted out of his contract with the San Francisco 49ers in March. He has filed a grievance against team owners he believes are conspiring not to hire him because of his protests.